Editor’s Note: The following entry is by guest blogger, Dr. Idil Boran, from York University in Toronto, Canada. Dr. Boran has previously reported on equity and justice issues that arose in the recently concluded Bonn intercessional meetings of climate negotiations under the UNFCCC. 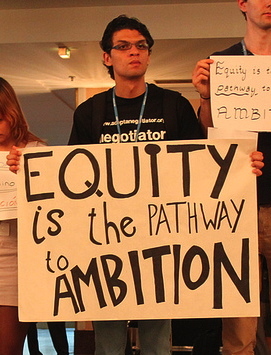 This latest report was made at the conclusion of these negotiations during which almost no progress was made in defining equity under UNFCCC by the Ad Hoc Working Group on Durban Platform For Enhanced Action (ADP), a mechanism under the UNFCCC that seeks to achieve a adequate global climate agreement, despite a growing consensus among most observers of the UNFCCC negotiations that nations need to align their emissions reductions commitments to levels required of them by equity and justice if the world is going to prevent extremely dangerous climate change. The UN Climate Conference held in Bonn, Germany, June 4-15, 2014, concluded in a generally positive tone. Much work has been done before COP 20 in Lima, where negotiators are expected to produce a fully written draft of the new agreement. International talks on climate change have taken many twists and turns since the UNFCCC came into effect. In the current round of negotiations important shifts are occurring. As explained in a previous post, the new platform of negotiations favors the concept of global participation, where every nation is expected to do its part in some capacity. This is to replace the idea of common but differentiated responsibilities, which was the guiding principle of the negotiations in the Kyoto era. This principle was specially opted to capture a sense of equity within a binding global treaty. The current focus on global participation is to facilitate agreement and induce greater participation. But does this shift imply that the new agreement will have to make a compromise on the issue of equity? Moral and political philosophers tend to think about equity in substantive terms, as claims about how to apportion the burdens and the benefits as part of a collective venture. The thinking is usually that of identifying an appropriate criterion of equity (a guiding principle) and then articulating an allocation of responsibilities from this criterion. This way of thinking can be applied to many topics arising within the Framework Convention. Take, for example, the new issue at the heart of the multilateral negotiations: the Warsaw Mechanism on Loss and Damage associated with climate impacts in developing countries that are particularly vulnerable to the adverse effects of climate change. When the issue of loss and damage is raised, a standard approach that comes to mind is that of prescribing an allocation of the costs associated with loss and damage (human, economic, as well as non-economic costs) by a criterion of equity. For example, historical accountability provides a morally powerful criterion. This is the idea that those who are historically responsible for the problem of climate change should provide the resources to deal with loss and damage. Ability to pay provides another criterion. Here the idea is that developed countries should take up the costs, simply because they are more wealthy. These arguments have been made for mitigation efforts, and they can also be made as new issues arise, such as the issue of an international mechanism on loss and damage. But the reality is far more complex. However neat these substantive arguments are, they do not capture the layers of discussions that actually take place. In fact, most of the discussions regarding the Warsaw Mechanism, at this point in time, are not over substantive questions. They are focused on deciding on the rules and procedures, and the composition of the Executive Committee, whose mandate will be to develop the details of the mechanism. But the questions that arise at this procedural level are no less interesting. As discussions continue, developing countries who feel threatened by the effects of climate change will press for greater representation within the Committee, and developed countries, such as the United States and the E.U. will press more on the importance of securing the right team of experts regardless of country representation. But why are developing countries vulnerable to the effects of climate change are pressing for more seats on the Committee? Clearly, when it comes to decisions made by the Executive Committee, they worry that their interests will not be taken into account, unless they secure greater representation. So, it looks like there is a problem of trust that needs to be addressed at the heart of the deliberations. Within rightful conditions of collective decision-making, equitable terms of cooperation can be captured and agreed upon. And this is exactly what the new round of negotiations aims to achieve by 2015, with more flexibility conferred to countries in making their contributions to the climate effort. What remains to be done, then, is to work on the conditions that will promote trust between parties. More than neat arguments from first principles, this may require specially talented people, with strong diplomatic skills working on the ground, who can foster a sense of building bridges, and a feel for working together on a global problem. This will also require the building of strong international institutions that put greater emphasis than ever on transparency, accountability, and governance. At this juncture then, if equity is the concern, there are reasons to invest in understanding what, if at all, can generate more trust between parties at the UNFCCC. Figuring out what it takes to secure mutual trust is more an art than strict rational argumentation. It has something to do with creating a welcoming and inclusive atmosphere, as opposed to a hostile one where all hold their cards close to their chests. 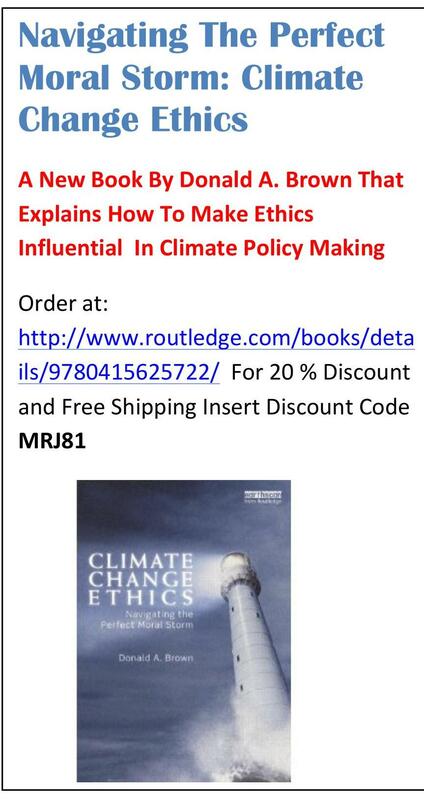 It therefore makes sense for academic researchers interested in the ethical, political, and legal aspects of climate talks to tune in to these dynamics. As for the institutional structure of the UNFCCC, adopting the right institutional rules and procedures can help in fostering mutual trust. That’s why the new multilateral assessment and review processes under development are of special significance. So is the effort to agree on a common metric on emissions reduction, so to allow all parties to pitch in their contributions in a coherent way, and work together toward ratcheting them up in the future. This may not be a magic solution to the climate problem, but it can set the foundations of cooperation that’s not only equitable but durable too. If successful, it can set an important precedent. This article was written to explain in simple terms why national responses on the basis of equity are an indispensable ingredient in any global solution to climate change. This article was also written because the media in the United States and other parts of the world are utterly failing to explain the importance of equity in national responses to climate change. This failure makes it easier for economic interests who perceive that they will be harmed if a nation reduces its carbon emissions to manipulate the public with such arguments as the United States should not reduce its emissions because China is the largest polluter in the world. Citizens around the world need to understand that all nations have a duty to reduce their emissions to levels required of them by equity regardless of what other nations do to retain any reasonable hope of finding a global solution to climate change. Since posting this article, nations have met under the United Nations Framework Convention on Climate Change (UNFCCC) in Bonn in early May, 2013 and in the first two weeks of June. In these meetings, equity continued to be a major focus of concern because of increasing scientific awareness of the urgent need of nations to increase their ambition in their greenhouse gas (ghg) emissions reduction commitments to have any hope of preventing dangerous climate change. Equity was not the only important issue under consideration at the Bonn meetings. Other significant issues under discussion were loss and damages, REDD (reducing emissions from deforestation and forest degradation), market mechanisms under the UNFCCC, NAMAs (nationally appropriate mitigation actions for developing countries), and technology transfer, and completion of the architecture for the second commitment period under the Kyoto Protocol. However, perhaps the most important issues in discussion in Bonn were those relating to structuring a new global climate change treaty that the world has agreed to complete by 2015 in Paris under the Ad Hoc Working Group on the Durban Platform referred to by acronym ADP. These discussions focused on finding agreement on pre-2020 ambition national emissions reductions commitments and a framework for post-2020 agreement, carried out in two different work streams. Parities working under the ADP are working to get a comprehensive deal by the 2015 deadline. The Bonn meeting marked the beginning of that “road to Paris” where 2015 COP-21 that is expected to finalize a new climate change agreement with legal significance that will come into force in 2020 . Parties at the May Bonn meeting stressed the need for nations to align their commitments on the basis of equity as required by the UNFCCC. During the May Bonn meeting some developing countries argued in behalf of a proposal by Brazil that developed countries must take the lead on emissions reductions that took into account historical responsibility. Other equitable frameworks were also discussed in May including frameworks known as “contraction and convergence,” “greenhouse development rights,” the “Indian Proposal,” and others. There was also discussion on a new framework that is based upon the idea that all people everywhere should have the same right to use global atmospheric space. A number of Parties spoke of the urgent need to close the ambition gap, as well as the quantification of the amount of adaptation that will be required in the light of the current scientific assessment of adaptation needs should current commitments not be met. 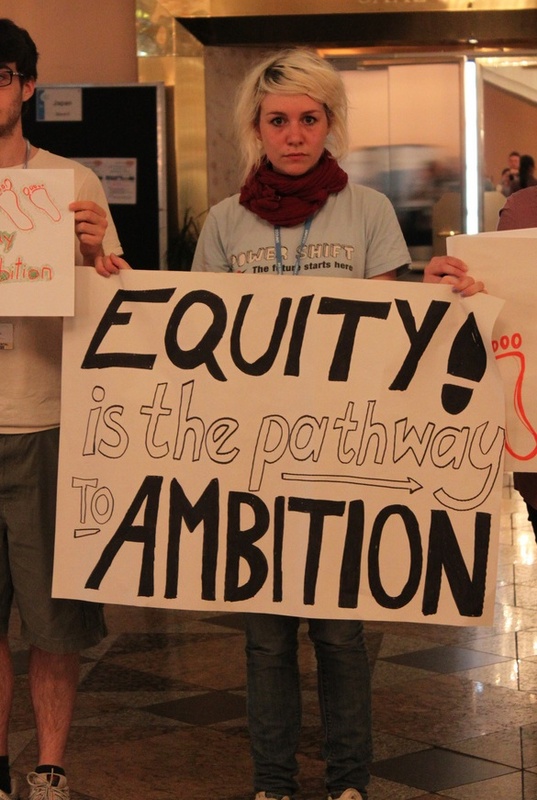 At the just concluded Bonn meeting in June, there was very little progress made in getting nations to increase their ambition based upon equity or on agreement about what equity requires. Although the June Bonn meeting saw some modest progress on a few issues including REDD, little progress was made on the substantive content of future national commitments under the new treaty to be negotiated by 2015. These issues will be taken up again in Warsaw at the next conference of the parties under the UNFCCC in mid-November.